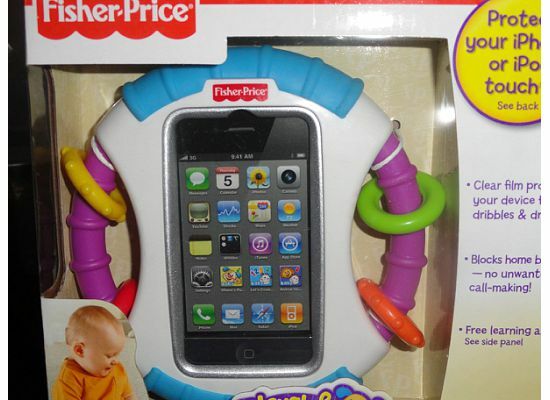 I have been waiting since February 2011 – nearly 7 months – when MSNBC reported on the Fisher-Price Laugh and Learn Apptivity iPhone Case that supposedly would be toddler proof iPhone case that would become available to the general public. My son had just turned one and never used the iPhone before, but I knew that it was only a matter of time before he was introduced to it. I do not view the iPhone as a parenting substitute, but a tool to help maintain control and provide a piece of mind for moms and dads while traveling with a baby and/or toddler – which we do a lot. Finally the second week in September, I received the Fisher-Price catalog in the mail and it highlighted the Apptivity iPhone case. I was so excited – not only because it was released – but it was only $15. The next day, I ordered directly from the Fisher-Price website and received it a couple of days later. With shipping and handling it cost $20.99 ($15 for the case and $5.99 for shipping). This product can also be ordered from Amazon for $14.99 not including shipping & handling and will be available in retail stores in October 2011. This case has been tested by my 19 mos. old son. This Apptivity iPhone case has not let me down; I am in love with it and so is my toddler. Here are some of the highlights that I love. 1. With the Apptivity iPhone case it eliminates any fear that if your toddler drops the phone that the glass will break. Most cases, including mine, do not have a protective front cover. 2. You do not have to worry about your toddler constantly touching the home screen and knocking them out of the audio book or other toddler game app they are playing. The home screen is protected by a think piece of plastic; whereby the home screen cannot be pushed. 3. You do not have to worry about your toddler drooling, or grubby fingers getting your iPhone dirty; it has a protective plastic over the top. Even with the protective cover, you can use the apps properly. Now, if they could only make one for husbands. 4. The volume works very well through the Apptivity iPhone case, so there are no worries that your toddler will not be able to hear the audio book or music. Though, the volume must be turned up before putting it in the Apptivity iPhone case. On the other hand, while flying it might be a difficult to hear initially, but after a few minutes you become attuned to it and so does your toddler. Please note, when I flew I asked the people in front of and behind me if they could hear the iPhone and they said no. 5. While my toddler was using it, I was able to respond to text messages that popped up. I was uncertain about this, but it did work. Of course, you cannot use the phone because you cannot speak into the microphone. 6. It does have a mirror on the back. My son is too old to really care about the mirror because he knows how to work the iPhone. However, if I was able to purchase this when he was less than a year old, this would have provided some extra entertainment. If you are planning to purchase an Apptivity iPhone case you will need to know the following things in order for the case to be effective. 1. The case to your iPhone/iPod needs to be removed in order for it to fit into the Apptivity iPhone case. The iPhone will not fit in the case with it on; we tried it and we could not get the back of the Apptivity iPhone case to close. 2. In order for your iPhone not to auto lock you, you must go into Settings>General >Auto Lock and select “never”. This is very important because once your iPhone is in the Apptivity case and it locks, you will not be able to unlock it without taking the case apart. One down fall to turning your iPhone Auto Lock to “never” is that if you forget that you have it set to “never” or your toddler puts the Apptivity case down and you are not aware, your iPhone battery will drain. I experienced this once this past weekend when we went to a wedding brunch and did not realize my son put the case down to read another book. I came back and my phone battery was depleted. 3. The Apptivity lock on the back of the case is difficult to open and close without a butter knife, a key or a quarter. This is great because the lock is secure and you can rest assured your toddler cannot get your phone out, but you have to remember to have one of these items handy if not you will not be able to retrieve your iPhone. Based on my recently flying trip with my toddler, I added a fourth issues to be aware of prior to purchasing. Updated on October 3, 2011. 4. If you are in an app, you cannot back out of it without taking the iPhone out of the case. So, if your toddler gets bored with an app or audio book, you have to undo the entire case. However, if you purchase or download for an example, a Sesame Street episode/podcast, an audio book, or movie via iTunes, you will be able to go back and forth between them all. My suggestion would be to have a wide selection on your iPod app, so you are not constantly taking your phone in and out of the case when your toddler gets bored. The Apptivity iPhone case overall gets a 4 out of 5. It has so many great features and for such a great price, but what precludes me from giving it a 5 is the possibility of my iPhone battery draining due to my Auto Lock set to “never” and that it is difficult for me to lock and unlock the actual Apptivity iPhone case. One thing I have done with the Apptivity iPhone case is my son is not allowed to play with the case unless the iPhone is in there and we are planning to let him use it; it is put away for special “occasions”. I do not want him to associate the case with a toy – even though it looks like one. He knows now once he sees it, he gets to watch one of his books or listen to “Melmo” (a.k.a Elmo) and he gets very excited. My recommendation is if you are looking to protect your iPhone from your toddler, it is well worth the $15 ($20 with shipping and handling) purchase. The picture below are the instructions on how to use the Apptivity iPhone Case. Love your review!! Can’t wait to order one. Will be great on our next trip!! I know you will love the case especially as much as you travel. For older kids, you can avoid all the disadvantages listed by just keeping the iPhone in it’s normal case, and using BubCap home button covers. Also, BubCaps work on iPads, not just iPhones. Thank you very much! I will have to look into that for when my toddler gets older. But, who are kids that are still chewing on things, the Apptivity case is great.